Image size: 21" x 17"
Each print is individually hand signed and numbered by the artist Terence Gilbert. Australia (foaled 8 April 2011) is a British-bred, Thoroughbred racehorse best known for winning the 2014 Epsom Derby. 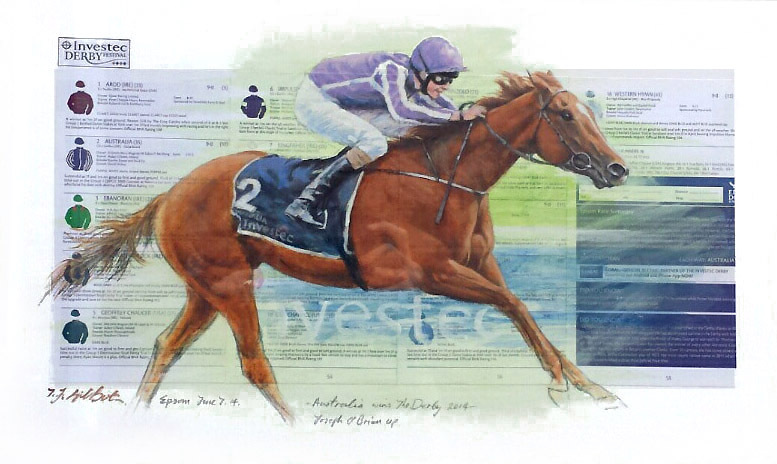 As a two-year-old in 2013, he won two of his three races, creating a very favourable impression when winning the Breeders' Cup Juvenile Turf Trial Stakes, and was highly regarded by his trainer Aidan O'Brien. In May 2014 he finished third behind Night of Thunder and Kingman in the 2000 Guineas before winning the Epsom Derby on 7 June.